You want to make your child an engineer. So does your neighbour or colleague. But the new data from AICTE, the regulator for technical or engineering education india, can be unnerving. As AICTE says that Lakhs of engineers (may be in few crore) in India are struggling to get placed in an extremely challenging market. And there are real chances that 20-35 percent of these students graduating out of India’s engineering colleges run the risk of not getting a job. There ‘s another risk, AICTE data points to. Those manage to get a job may be compelled to take jobs well below their technical qualifications in a market where there are few jobs for India’s overflowing technical talent pool. 1) Unhealthy craze for Engineering: In India everyone seems to make their child an engineer. The trend is encouraged by a flood of institutes (offering a varying degree of education). The various governments have played a negative role in fueling this trend as well. No one is asking, from where jobs will come for 15 Lakh Engineers passing out every year in India. 2) Jobs are created by Consumption: Ask your self a simple question — How are Jobs created? The Answer to this question is Consumption. When there are enough people consuming products and services, there’s demand, and to fulfill that demand, jobs are created. There will be as much jobs in India, as there’s consumption. There will be more jobs if India has job markets abroad. Unfortunately, no government and parent is considering this fact. 3) There’s not Much Consumption in India: India may be growing consumption-wise; but consumption in India can’t create that much jobs to absorb truckloads of engineerings entering the job market every year. According to multiple estimates, India trains around 1.5 million or 15 Lakh engineers, which is more than the US and China combined. This is resulting in a situation where India’s engineers are struggling to subsist in an extremely challenging market., in a way that does justice to their skills. 4) Too much reliance on IT market: All those parents who want to make their child an engineer AND the government which is creating all those engineers, are relying too much on Information Technology job market. Although information technology and manufacturing are the two key industries hiring these engineers ; the actual hiring has declined in recent years. According to data from AICTE, the regulator for technical education in India, there were 1,511 engineering colleges across India, graduating over 550,000 students back in 2006-07. 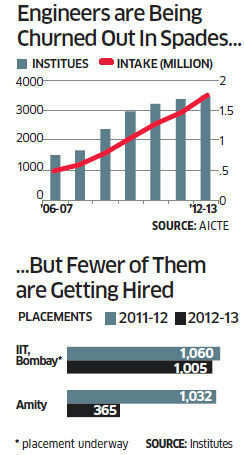 Fuelled by fast growth, especially in the $110 billion outsourcing market, a raft of new colleges sprung up — since then, the number of colleges and graduates have doubled [Source Economic Times]. The decision to opt engineering as a career in India, is normally fuelled by the aspirational status of elite engineering colleges like IITs and class toppers (top 5 percent). This is not a very scientific method of decision making; as challenging job market or recession, high scoring students and those from elite engineering colleges will always get the job first. All the struggle is for the lower half. 6) Conventional graduate courses like BSc, BA don’t make a person ready for Job market; that’s why people opt for Engineering, which is a professional programme. It’s time parents take an informed decision on putting their child to engineering programmes. The factors like aptitude, inclination for engineering, ability need to be taken into account before taking the important decision.